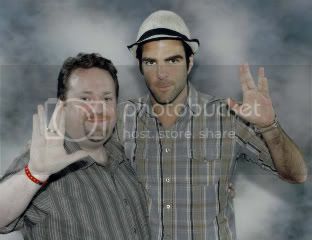 I want to meet Zachary Quinto! He's a great guy. Made my YEAR with this!! Hope your wish comes true!! WOW where did you meet him? thats such a cool photo! Met him in Vegas last year. He was such a nice guy. He would be a great guest. I know there were trek fans out there that loved him but for me personally, maybe it was the fact that Im a trek fan that makes me feel how I do about him? 9 out of 10 is good though! I thought he did a great job in the film. Sure looked the part. But I'm a big Trek fan and found him perfect for the role. It's just a matter of how different people would prefer a role be played, a matter of taste. But I'm a big Trek fan and founb him perfect for the role. Just don't get me started on the guy who played Sulu, where was his accent? Are they not supposed to be like younger versions of the original crew (well as much as possible). He was my least favourite out of all of the characters in the film which is a shame because I love Sulu, and I think it was his voice that was the main problem for me, he didn't seem like Sulu.